The Village Voices simulation is meant to give students a fuller understanding of the conditions necessary for the various technologies that are used to provide clean and safe water to people in developing countries. In short, it is a way for students to become familiar with the solutions to the water crisis. We recommend that students familiarize themselves with the "Types of Projects" section of The Water Project website before the simulation, (http://thewaterproject.org/water_project_detail.asp) with access to the site, or detailed notes during the simulation. In this activity, your class will be broken into groups of four to determine the best water solution for each of four different communities. You can choose to assign students one or all of the communities depending on your time allowance. Each village is completely independent. Each student will assume a role as a Geologist, Climatologist, Public Health Officer, or Village Elder. Students will each receive a paper with specific insights for their role on each of the 4 villages. Using the information from the "Types of Projects" section of The Water Project website, groups must work together to determine which technology is best for each village. or other awareness and fundraising campaign where the class teams up to donate to a clean water project. 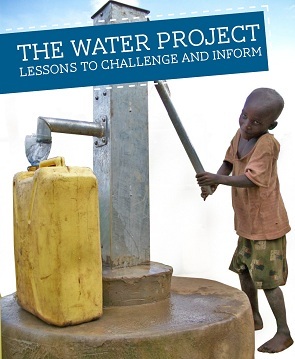 For other ideas and resources, see http://thewaterproject.org/start-a-fundraiser.php for downloadable ideas and a Media Kit. For more inspiration, read what other groups have done to bring clean water to communities in need on our (Featured Fundraiser Pages. As an expert geologist, the people in this meeting look to you for advice on how deep the water table is and what can be done about pulling water from the earth. If you're going to drill a well, it's up to you to make sure it's the right depth. This soil here is very rocky, but it appears to be consistent all the way down. To reach water we will have to go down at least 400, maybe even 450 feet. The ground is dry but not as bad as I've seen. I just don't think it is good for crops. There aren't any rivers within walking distance, but the water table is only about 40 feet down. There is a riverbed just a few hundred feet from the village, but it's dry right now and seems to have been that way for months. The water table, you ask? It's about 200 feet below the surface. The bad news is that once you get past the first few feet of good soil, the rock goes down 400 feet and then turns into sand for another 200 feet. After that, you still have to go another 250 feet before you can actually get to the water table. Water - it's your job. Understanding how the rain impacts potential water solutions is why you're here at these meetings. Make sure that whatever option your group chooses is sustainable. It rains here almost everyday for a few minutes but we never have more than an inch at a time. This village is a great example of a clear tropical climate. Massive rains come twice a year, but the rest of the time it is bone dry. This is Sub-Saharan Africa. The Sahara is a desert - of course it's dry. We only get rain twice a year, but when it rains - watch out for flash floods! It rains here a few times a month sometimes a few inches, sometimes a little less. Your assignment as a Public Health Officer in Rural Africa comes with its own share of challenges as you experience life in several different health clinics in the region. Using your notes, help the group to decide what is the best solution to get clean, safe water. There are lots of young girls here who are already have terrible back problems from walking so many miles to the river with so much weight on their backs. Between the back problems and the cholera outbreak last year, we really have to do something. People do what they can to boil water, but the well in the next village has been contaminated, and sometimes people just can't afford the extra fuel needed to boil. Water is a luxury here but the people have learned to adapt, now only if we could get the animals under control! The thatched roof here at the clinic is a pain when it rains, I have to run around to make sure that my patients don't get wet in their beds from the holes in the ceilings. I should be grateful though, this roof is one of the best in the village. You have become a trusted advisor to the people in several different villages. As you approach this meeting, you are a representative of each of the local water boards. Use these quotes from the local water boards to make sure that their interests are served. We have never had a well here but have always walked several miles to get water from the river. We work very hard here but we have never had very much money. When I was young we had a good well but when the rebels came, it was used for scrap metal. Now it's just a concrete slab. You only have to live through one tropical storm to really understand the power of water. If only we could hold on to those rains a little bit longer! We've been talking about getting water for many years and raising money too. Whatever the cost, now is our chance. This additional activity will allow you to bring in discussions relating to corruption, bias, cultural relativism and a variety of other challenges that really do sometimes occur in the field. However, it may also cause increased tensions and/or hurt feelings as students take on a new level to their roles. As such, please take care if choosing to introduce this level to the conversation. After having each group determine what the best solutions are, give each student this insight into their back-story. The Expert Geologist also owns the drilling company and only gets paid if a well is built. The Expert Climatologist has been bribed by the geologist to get a cut every time (s)he recommends a well be built. The Public Health Officer is a foreigner and suffering from a waterborne disease him/herself. The Village Elder, though excited about the potential for clean water, is not very trusting of the Public Health Officer because (s)he (the Village Elder) used to be the medical expert in the community using traditional remedies. Option 1: Discuss how the dynamic of the conversation, and their answers may change with this new information. If time allows, you may even want to have groups re-do their discussions. Option 2: Reveal this information to students individually and have them re-do their discussions. Then discuss how their conversations/answers have changed.